Caused by foot fungus that is able to grow between the toes, athlete’s foot causes itching, inflamed skin, and blisters on and in the skin of the toe areas. Left untreated, athlete’s foot can spread to the soles, toenails, and other parts of the body. The condition gets its name from the prevalence of athletes that are struck with the fungal infection, whether from the locker room or the consistent use of athletic footwear. Wearing protective footwear in gyms, locker rooms, and around pool areas. Using talcum powder within enclosed shoes. Wearing socks that keep your feet dry. Replacing shoes and socks on a routine basis. Wearing open-toed shoes when feasible. Thoroughly cleaning in between your toes when showering. Completely towel dry these areas too. Recurring instances of athlete’s foot (when it doesn’t clear up with the use of over-the-counter fungicides) is usually the cause of fungus that is present in the deeper layers of the skin. Persistent athlete’s foot generally needs the aid of a podiatrist who can prescribe an antifungal drug to be taken orally. 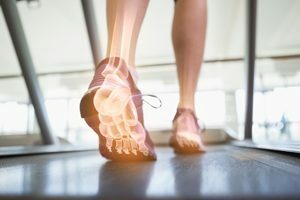 Make sure to call the foot specialists at AllCare Foot & Ankle Center to learn what other types of athlete’s foot treatments we can provide to you. Serving the cities of Arlington and Dallas with podiatric medicine, AllCare Foot & Ankle helps thousands overcome the symptoms of athlete’s foot every day. Contact a podiatrist now for a comprehensive consultation to address your foot and ankle health needs.